In these days of smartphones, we all use to take photos for anytime at any place through the smartphone camera. This easiest possible way of capturing memorable moments definitely brings smile on everyone face, but imagine when smartphone instantaneously gives you printed photo. Off course, this brings thousand-dollar smile on your face. Prynt Smartphone Case does the same! 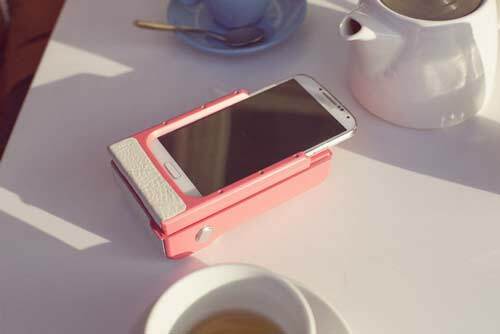 It is not just a case of your smartphone; it has built-in printer that quickly delivers printed copy of your photo. Therefore, you don’t need to connect your phone to printer or your computer to get the printed copy of your photo. Using this Prynt Smartphone Case, you can easily get printed photo on the go. It prints photo of size 2”x3” that you can stick either in your album or around various places in your home like on the fridge door, on the mirror or on the closet. It has also an interesting feature, which everyone definitely like, it converts photo into life through augmented reality. That means you can see the videos in your friends’ photos, too! Print and pass your photos around for a creative new way to tell your story. The Prynt Smartphone Case comes with backup of 10 blank ZINK papers, so when you get short of these papers you need to refill the case. This awesome smartphone case definitely would definitely sound interesting but you will have to compromise on one of its feature, which is its bulky body. It is a Kickstarter project that has crossed its goal value but you can still make a pledge to reserve one for your phone. Make sure that it is made compatible with limited smartphones including Apple’s newer iPhones and some Android devices including Galaxy S4 and S5.